Post Office is a post office which provides a range of mail services and also sells stationery and other convenience items. 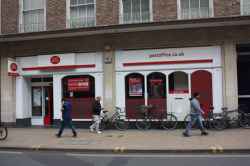 Based in St. Andrews Street, Cambridge, Post Office is a post office. Post Office is in St. Andrews Street Cambridge. You can view a list of neighbouring businesses by going to the St. Andrews Street page. If you would like a list of other listings throughout Cambridge, please visit the Post Offices section of this website. Note: the pin is positioned at the postcode centre, and may not correspond with the precise location of 57-58 St Andrews Street.